Extraordinary dental professionals were honoured with Public Oral Healthcare Awards for their care and commitment to public dental services. The awards, presented annually by Dental Health Services Victoria (DHSV), are given to dental professionals who go above and beyond in providing dental care to disadvantaged Victorians. The winners received funding of $5,000 for their professional development as well as a trophy designed by Philip Stokes Gallery. In addition to the winners, three highly commended awards were also presented. Dr Whelan commenced his career in 1981 working for the School Dental Service in metropolitan and remote areas around the Mallee. In 1983, he moved to Shepparton as Regional Dental Officer for Goulburn North East Region, where he extended the scope of delivery to all schools in the region including special development schools and intellectually disabled centres. established an intern program that has mentored approximately 100 new graduates. The popularity of this program saw 48 applicants apply for 4 positions in 2010. 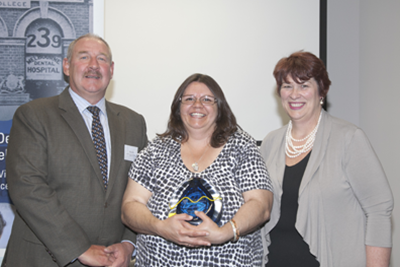 This and other innovative workforce practices resulted in Goulburn Valley Health Dental Clinic being awarded the “Silverman Dakin Award for Innovation in Workforce Development”. provided direct access to at-risk clients through the Teen Challenge Drug and Alcohol Centre, Shepparton Homeless Youth, and all Residential Disabled Centres across the Goulburn Valley. Dr Whelan has, on a number of occasions, used his holidays to volunteer to provide dental treatment in Vietnam, Cambodia and remote Aboriginal communities in Alice Springs. Christine Ingram began her career as a Dental Assistant with the Victorian Aboriginal Health Service and was appointed to the role of Oral Health Manager in 1998. Christine leads a strong dental team catering to the needs of the Aboriginal people and collaborates with other health organisations to motivate Aboriginal clients to improve their oral health. established strong working relationships with other health organisations. In an environment where there are severe workforce shortages, Christine has recruited and retained dentists with little effort because she has made VAHS a desirable and happy workplace. In addition to her work at VAHS, Christine is on the boards of many organisations associated with Aboriginal welfare including the National Aboriginal and Torres Strait Islander Health Worker Association. Christine’s dedication, compassion and tenacity have motivated a large number of Aboriginal clients to seek dental assistance and improve their wellbeing and self esteem. Dr Gussy has provided support and guidance to the public oral health sector since 1991. In his current role as a Clinician at Bendigo Health, he provides high quality clinical care and is focussed on developing the future oral health workforce in Victoria. As Associate Professor of Oral Health at La Trobe University, Mark directly impacts and shapes the oral health workforce. Mark has been instrumental in expanding the scope of practice of oral health therapists. He developed the first course for oral health therapists that enabled them to treat adults aged 26 years and over. By assisting to expand the scope of practice of oral health therapists, Mark has helped to improve access to quality public oral health services for the Victorian community. His list of publications is extensive and he is also involved in several programs, including the ‘Oral Health of Children’ program at Bendigo Health, on a practical level. 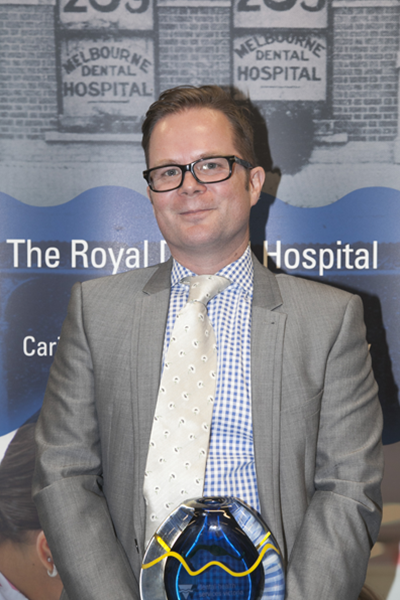 Mark is highly respected by his colleagues and the broader health sector. He fosters engagement and empowerment, and always supports and encourages others. Dr Riley has worked in public dentistry for over 30 years and is currently Manager of Oral Health Agencies in the western regions of Victoria. Dr Riley’s commitment to the public oral health sector has seen him treat Kosovo refugees at Puckapunyal, review a dental clinic in the Antarctic and integrate the School Dental Service into local community dental clinics. Dr Riley has also played an important role in increasing the scope of practice of oral health therapists. Dr Philip Wong is a pioneer in delivering dental care to homebound patients. He was employed by the Royal Dental Hospital of Melbourne in 1984 to work on the first ever mobile dental service. Dr Wong helped to build this service from a one van to a four van service. During that time he even worked without full pay to ensure the service did not cease to exist. Dr Wong has been and remains an inspiration to a whole new generation of clinicians wanting to work in this area. Dr Alex Thomas has been a dentist at the Victorian Aboriginal Health Service for over 20 years. Dr Thomas was instrumental in establishing a program to educate the Aboriginal community about communicable diseases and their association with good dental care. Individual clients have benefitted from his excellent clinical care, his strong relationships with the Aboriginal community members and his leadership in education and health promotion activities.